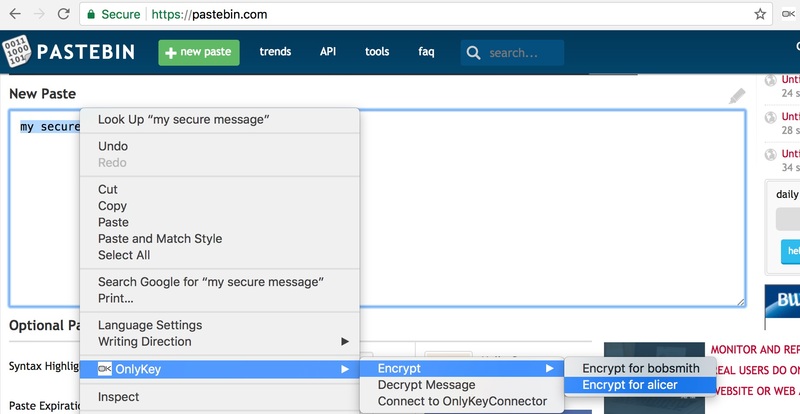 A chrome extension that enables simple click to encrypt/decrypt PGP messages in the browser with Keybase and OnlyKey. Still in early development available for testing only. With Keybase user/key management is made easy and with OnlyKey private keys remain offline and protected. They are not accessible to the browser, the extension, or the local computer. 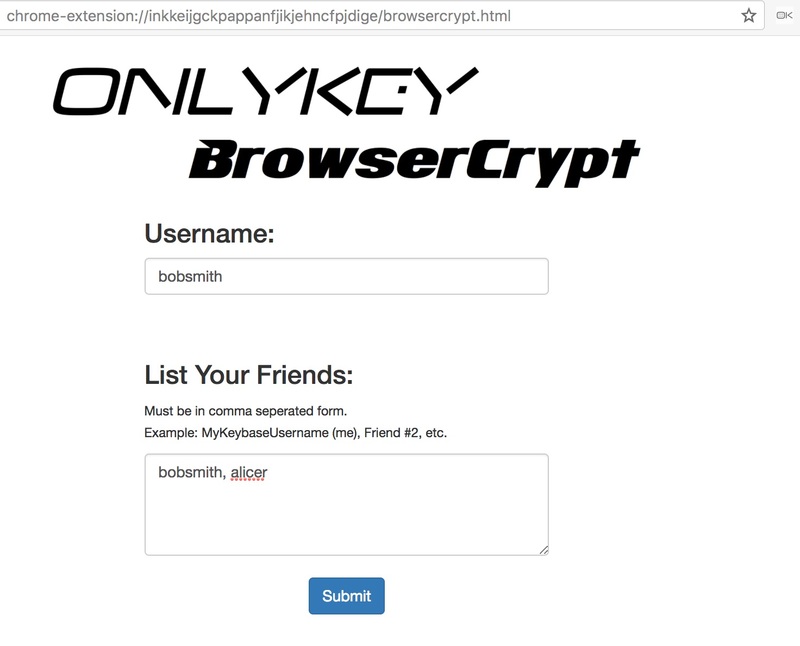 By using U2F the extension can send messages to OnlyKey to be securely decrypted and signed offline. This provides similar function to a token/smart card but no drivers or software required. With this extension and an OnlyKey secure messages can be sent using Windows, Mac, Linux, Chromebook. After you create a Keybase account using the instructions provided in the User’s Guide you can add your account and your Keybase friends. This way you can send encrypted messages easily without having to remember their Keybase ID. Type in your friends Keybase Usernames in the second box. Separated by commas. The encrypted message will be displayed and you can paste it into an email, IM, app or pretty much anything. Empower the people: Give people the ability to securely send and receive messages using any computer with no complicated software/drivers required and no worrying about compromise of user’s private identity. Private: No logins required. No tracking!!! No emails. No ads. No demographics. No local proof of who was using this extension as anyone can enter any username and/or list of friends from publicly available Keybase profiles. Strong Crypto - Everything should be sent via HTTPS to/from the web application. Data between local browser and OnlyKey should be encrypted using AES/ECDH shared secret (NaCl + AES-256-GCM). This means on the local computer data is end-to-end encrypted and even if a malicious applications were to intercept communication it would be encrypted and unreadable without the key. Open source & audit-able - What you see is what you get this repository is a Github page hosted directly on Github. Please, feel free to commit fixes! This work began with a fork of Anycrypt written by Austin Walters.